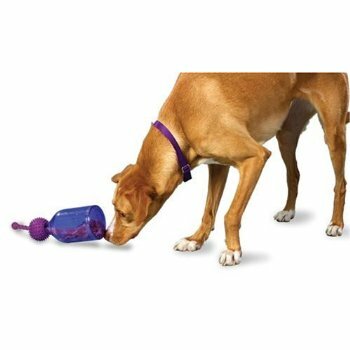 Just in case Buddy ever feels like shooting up his toys, Premier has made sure that at least one toy survives: it's the Busy Buddy Tug-a-Jug. 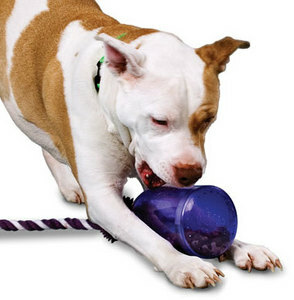 Why do dogs need a bullet proof material for the Tug-a-Jug? Because this devilish creation has treats inside, which are nearly impossible for him to get out of the bottle. The catch is that he can see the treats, hear them rumble around and, of course, smell the little buggers... but it's tough as a bullet proof bottle to get them out. And you know how a dog dogs stuff he can't have. 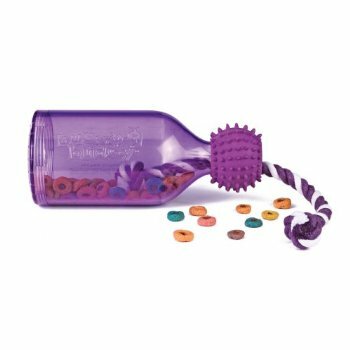 This kind of toy is meant to keep Buddy busy for a long time. "Hmm. Smells like some good stuff in there. Wonder if Mom knows about them..."
"Okay. I'll just take this for a walk and see if it spills anything." "No, there's probably more to this than meet the nose. You have to chew your way inside." "Now, I'm getting mad. I'm going to bark at it until it gives me what I want!" You know what the next step is for Buddy; destruction. That's why the Busy Buddy Tug-a-Jug is made of a bullet proof material. (Premier says it is non-toxic.) 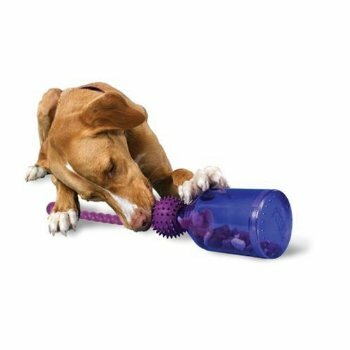 Prior to this step though, Buddy can chew on the rope and the hard rubber dental cleaner, and even swing and fling the toy around. Or you can play a game of fetch with it. But, I recommend you give Buddy some treats when the play is done, and put the toy away until the next time, because you know that dogs can be dogged. 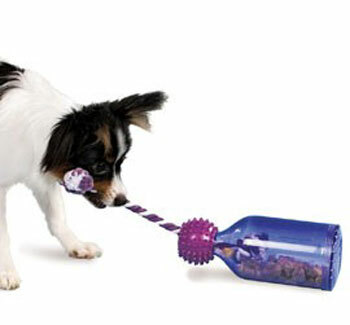 Busy Buddy Tug-a-Jug is available at Amazon.com in extra small, small, and medium/large. My Lab manages to chew through every toy we've bought for him--even the "Tiger Tested" #10 on the tough scale. I'd think bullet-proof material might actually stop his destructive jaws!